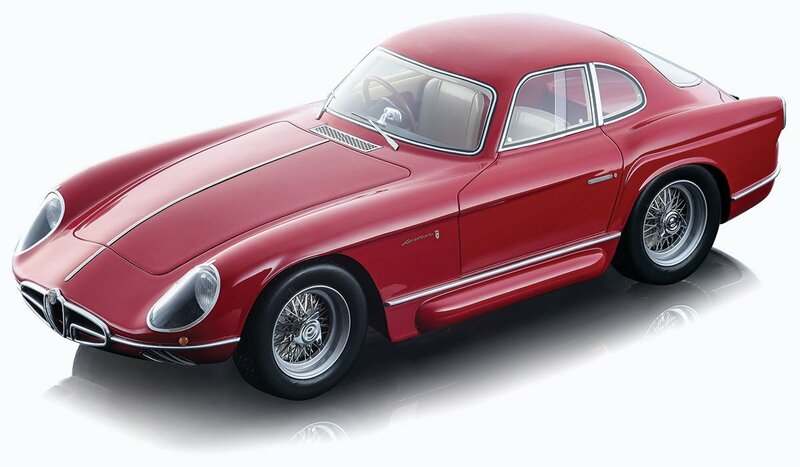 Tecnomodel’s latest 1:18 Italian road car project is the stonkingly beautiful Alfa Romeo 2000 Sportiva. Alfa produced the 2-litre Sportiva in 1954. The intention had been for it to be made available in a small series for its more sporting clientele, as well as for it to be homologated for touring car racing, but ultimately only four were ever built. Two survive today as part of the Alfa Romeo Museum collection. The car was designed by Franco Scaglione at Bertone. Like the earlier Disco Volante, the car used a tubular space frame chassis covered by an aluminium body. Some traits of the 2000 Sportiva, such as the wrap-around rear window and rear end treatment, were later seen on the mass-produced Giulietta Sprint. As usual, Tecnomodel has been rather miserly with the limited edition number on this replicas. So get in touch if you don’t want to miss out.